Diplodocoidea contains three wings: Diplodocidae, where the popular diplodocoids such as Apatosaurus, Barosaurus, Brontosaurus, and Diplodocus hang out; Dicraeosauridae, somewhat undersized and short-necked sauropods that are seemingly content to be represented in the public eye by Amargasaurus and its magnificently strange vertebrae; and Rebbachisauridae, also generally known for undersized and short-necked sauropods represented in the public eye by one exceptional taxon. 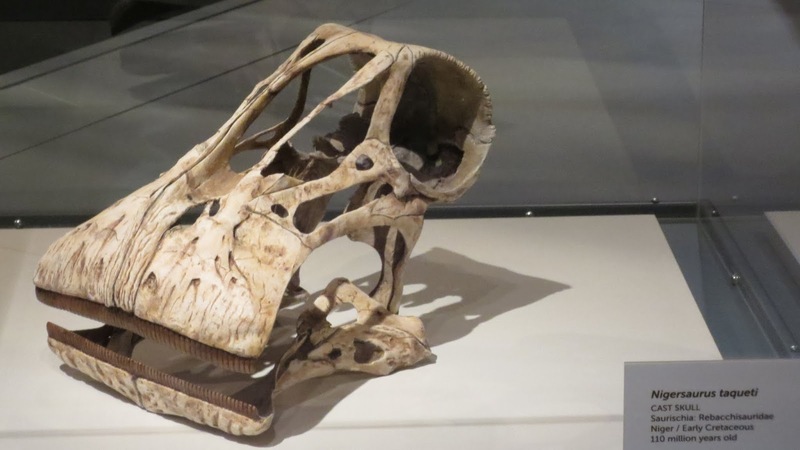 In the case of rebbachisaurids, it's Nigersaurus, famous for its skull, which looks kind of like the animal habitually slept with its snout pressed against a wall. Yeah, like that. Photo taken at a traveling exhibit at the Science Museum of Minnesota back in May 2014. 2018 has been a pretty good year for dicraeosaurids, which picked up Lingwulong and Pilmatueia. In a quiet way, it's been an even better year for rebbachisaurids. The group laid claim to the enigmatic sauropod Xenoposeidon (Taylor 2018), then made an even bigger splash laying claim to erstwhile super-sauropod Amphicoelias fragillimus in the new, downsized guise of Maraapunisaurus (Carpenter 2018). Finally, the group picked up an entirely new member, Lavocatisaurus agrioensis (Canudo et al. 2018). Black is diplodocid "Amphicoelias fragillimus", green is Maraapunisaurus fragillimus, which can just about hide beneath the tail of the old estimate. Always remember to check if your sauropod will shrink before you wash it. Figure 7 from Carpenter (2018). Currently there are sixteen species accepted as rebbachisaurids, although of course they are not all equally well-represented. Most of the species are from South America, with a few from Africa, Europe, and North America. 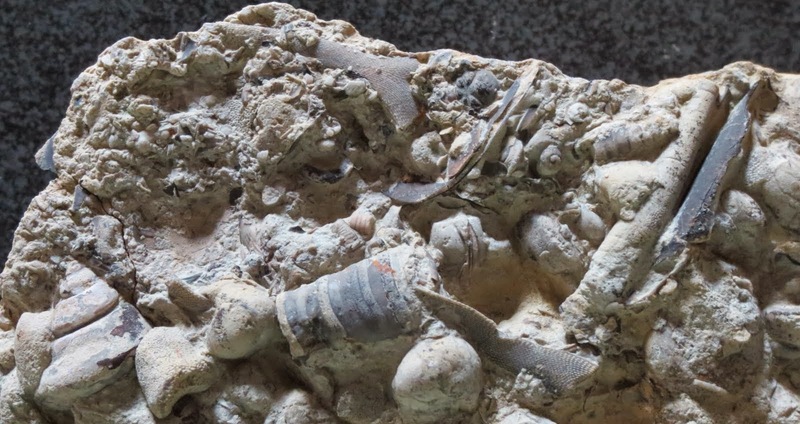 Almost all known species lived in a relatively brief 35-million-year time frame in the middle Cretaceous, from the beginning of the Barremian, about 129 million years ago, to the end of the Cenomanian, about 94 million years ago. 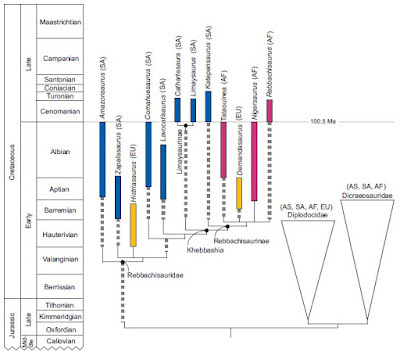 These two points make the additions of Maraapunisaurus and Xenoposeidon even more notable, because they help to fill in the "ghost lineage" of unknown early rebbachisaurids that existed between the split with the rest of the diplodocoids and the heyday of the group. Maraapunisaurus also expands the rebbachisaurids into North America, and the classic Morrison Formation, which is looking more and more like a traffic jam between just about every major group of sauropods. Figure 5 from Canudo et al. (2018); Maraapunisaurus and Xenoposeidon slot right into the dotted section leading to the rest of Rebbachisauridae. From a human standpoint, rebbachisaurid history begins in 1954, with the naming of Rebbachisaurus garasbae for a variety of postcranial elements found in Morocco (Lavocat 1954). The concept of a Rebbachisauridae did not really coalesce until the late 1990s, which is not too surprising because until then there was only Rebbachisaurus or bust ("bust" being "Amphicoelias fragillimus"), and nobody really knew what to do with Rebbachisaurus. The purported second species "R." tamesnensis did not help matters, because it can be most accurately described as an amalgamation of several sauropod faunas. If you pull out your trusty copy of the Normanpedia (Norman 1985), you'll find Rebbachisaurus listed as a brachiosaurid, which is obviously impossible because any time someone says they have a brachiosaurid, it turns out to be something else. McIntosh (1990) had it as a dicraeosaurine diplodocid, which was basically right-on for 1990. 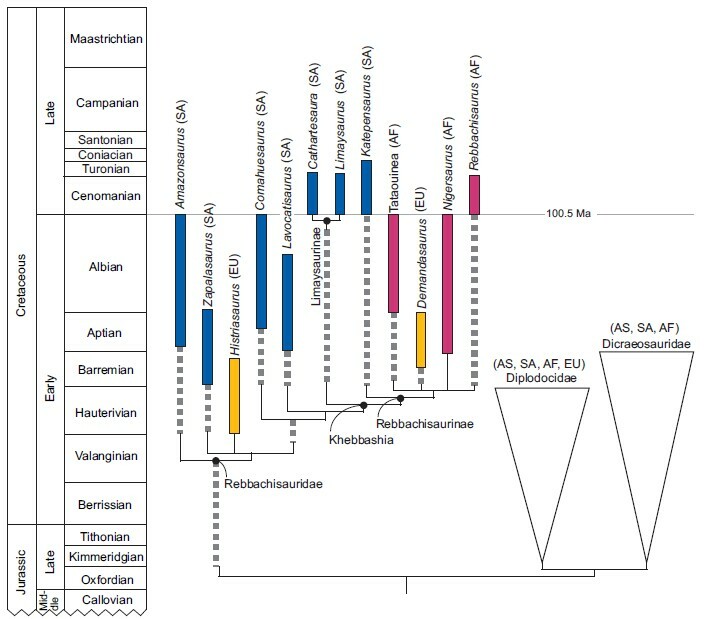 Derived rebbachisaurids can be divided into rebbachisaurines (nigersaurines of some publications) and limaysaurines, which together make up the clade Khebbashia (Fanti et al. 2015). The word "Khebbashia" reflects the origin of Rebbachisaurus, in which "Rebbach" is thought to be a transliteration into French of "Khebbash" or "Khebbache", a semi-nomadic tribe in Morocco (Wilson and Allain 2015). As such, "Rebbach" probably ought to be pronounced more like "Khehb-bash" (Wilson and Allain 2015). If you think of "Khebbashia", it'll be easier; just remember to hit both "b"s. Rebbachisaurus wouldn't be the first dinosaur name with a non-intuitive pronunciation: the former unicorn hadrosaur Tsintaosaurus, for example, is supposed to be pronounced more like "Chingdousaurus". Most rebbachisaurids were small-bodied for sauropods. Aside from Maraapunisaurus, which may have been around 30 m (100 ft) long (Carpenter 2018), we're dealing with animals on the order of 10 m (33 ft) long (Sereno et al. 2007). Rebbachisaurus itself is somewhat misleading; vertebrae from this animal are comparable in height to those of Argentinosaurus, but the rest of it was not quite so big, in fact quite a bit less big. Based on the humerus, Rebbachisaurus was more like 8 to 12 metric tons (about 9 to 13 tons). Instead of a giant sauropod, it was a modestly sized sauropod with very tall vertebrae (Wilson and Allain 2015). This also accounts for the contraction of Maraapunisaurus after being recast in a rebbachisaurid mold (Carpenter 2018). Proportionally tall neural spines and small centra are rebbachisaurid features, with Rebbachisaurus having something of a sail-back. Unlike their diplodocid and dicraeosaurid cousins, rebbachisaurids did not have split ("bifid") neural spines in the neck or back vertebrae. Necks also tend to be relatively short. The one characteristic that always seems to come up with rebbachisaurids is the "racket-like" expansion of the distal scapula, "distal" in this case being the part that's farther away from the articulation with the arm. Nigersaurus taqueti, perfectly sized for the home. Figure 3 from Sereno et al. (2007); the human is 1.68 m (66 in) tall, the upper scale bar is 10 cm (4 in), for B through E, and the lower scale bar is 5 cm (2 in), for F. Note the broad scapula. Rebbachisaurids were not simply smallish sauropods with short necks, though. These sauropods were among the most pneumatic dinosaurs. To put it simply, a surprisingly large amount of a rebbachisaurid was actually air. Neck and back vertebrae were reduced to thin plates of bone (Sereno et al. 2007). At least one species, Tataouinea hannibalis, developed pneumatic chambers in its ilium and ischium as well as somewhat more pedestrian pneumatic features in its sacral and tail vertebrae, indicating the presence of abdominal air sacs (Fanti et al. 2013). Ibiricu et al. (2017) found pneumatic features in the transverse processes of the back vertebrae of Katepensaurus goicoecheai, also known in birds and other theropods but not known in other sauropods. What was the advantage of being a paper-mâché sauropod? Ibiricu et al. (2017) suggested that by lowering the density of the skeleton, the amount of energy used to move was reduced, and with it the heat produced. This in turn could have allowed rebbachisaurids to survive in hotter environments than other sauropods. Ibiricu et al. also noted that saltasaurines (derived titanosaurs), another group of small-bodied sauropods, were also heavily pneumatized. The Cretaceous was a pretty warm time in general, and the Cenomanian heyday of rebbachisaurids was within the Cretaceous Thermal Maximum, about as warm as it's gotten over a sustained time frame since well before the beginning of the Mesozoic. On the other hand, the heat doesn't seem to have fazed the mid-Cretaceous super-sauropods Argentinosaurus, Paralititan, or Patagotitan. Idealized rebbachisaurid showing distribution of bones known to have pneumatic features (gray) and inferred air sac positions (Figure 9A, Ibiricu et al. 2017). As is typical with sauropods, we don't have a lot of rebbachisaurid skull material. The best stuff comes from Nigersaurus and Lavocatisaurus, which means up until a couple of weeks ago just Nigersaurus. Nigersaurus is best known for its expanded, linear tooth row, which was wider than the rest of the skull and featured teeth packed into dental batteries. The aesthetic effect is to replicate the appearance of the upholstery attachment of a vacuum cleaner. Whatever Nigersaurus was doing, its skull was optimized for bringing a large number of simple pencil-like teeth into action at once across a single front. The rest of the skull, or what there is of it considering that it seems to be made of a few well-placed struts, is also pretty weird. Nigersaurus frankly has one of the strangest skulls known for any non-avian dinosaur, and it's going to be interesting to see if any other rebbachisaurids were quite as monomaniacal about the evolution of their feeding equipment. Based on the more Diplodocus-like skull of Lavocatisaurus, Nigersaurus may be the Stegosaurus or Triceratops of rebbachisaurids (where the first well-known example of a group eventually turns out to be very distinct from the other members). Both sauropods, however, may have had keratinous sheaths on the tips of the jaws (Sereno et al. 2007; Canudo et al. 2018). They both also had skulls that appear very delicate. We've already seen the skull of Nigersaurus (go here for more); why not try Lavocatisaurus agrioensis? Figure 3 from Canudo et al. (2018); 10 cm (5 in) scale bar for A through E (presumably I as well), 1 cm (0.4 in) for F, G, and H.
Finally, if you want one more piece of rebbachisaurid trivia, Histriasaurus boscarollii is not only the only non-avian dinosaur named from Croatia, it is, as far as I know, the only dinosaur named from a fossil collected below sea level. Canudo, J., J. Carballido, L. Salgado, and A. Garrido. 2018. 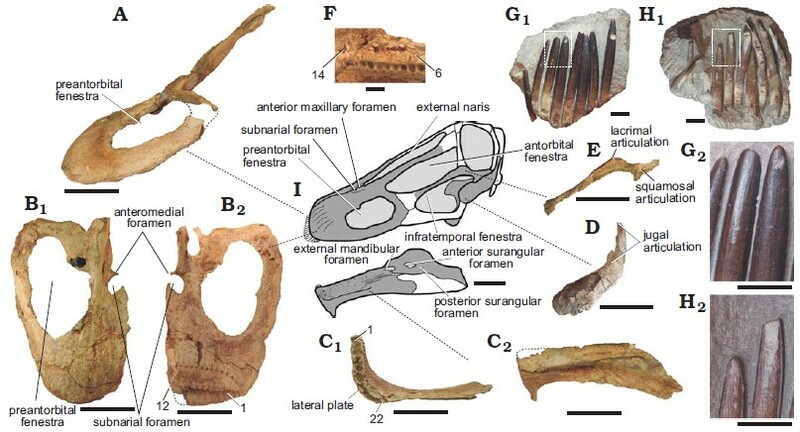 A new rebbachisaurid sauropod from the Aptian–Albian, Lower Cretaceous Rayoso Formation, Neuquén, Argentina. Acta Palaeontologica Polonica 63:13 p. doi:10.4202/app.00524.2018. Carpenter, K. 2018. Maraapunisaurus fragillimus, N.G. (formerly Amphicoelias fragillimus), a basal rebbachisaurid from the Morrison Formation (Upper Jurassic) of Colorado. Geology of the Intermountain West 5:227–244. Fanti, F., A. Cau, M. Hassine, and M. Contessi. 2013. A new sauropod dinosaur from the Early Cretaceous of Tunisia with extreme avian-like pneumatization. Nature Communications 4, article number 2080. doi:10.1038/ncomms3080. Fanti, F, A. Cau, L. Cantelli, M. Hassine, and M. Auditore. 2015. 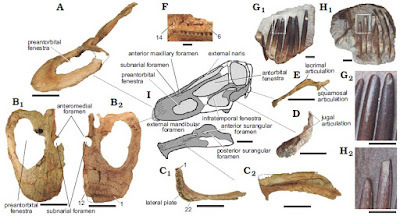 New information on Tataouinea hannibalis from the Early Cretaceous of Tunisia and implications for the tempo and mode of rebbachisaurid sauropod evolution. PLoS ONE 10(4):e0123475. doi:10.1371/journal.pone.0123475. Ibiricu, L. M., M. C. Lamanna, R. D. F. Martínez, G. A. Casal, I. A. Cerda, G. Martínez, and L. Salgado. 2017. A novel form of postcranial skeletal pneumaticity in a sauropod dinosaur: Implications for the paleobiology of Rebbachisauridae. Acta Palaeontologica Polonica 62(2):221–236. doi:10.4202/app.00316.2016. Lavocat, R. 1954. Sur les dinosauriens du continental intercalaire des Kem-Kem de la Daoura. Congrès Géologique International. Comptes Rendus de la Dix-neuvième Session 15:65–68. Norman, D. 1985. The illustrated encyclopedia of dinosaurs. Crescent Books, New York, New York. Sereno, P. C.; J. A. Wilson, L. M. Witmer, J. A. Whitlock, A. Maga, O. Ide, and T. A. Rowe. 2007. Structural extremes in a Cretaceous dinosaur. PLoS ONE 2(11):e1230. doi:10.1371/journal.pone.0001230. Taylor, M. P. 2018. Xenoposeidon is the earliest known rebbachisaurid sauropod dinosaur. PeerJ 6:e5212. doi:10.7717/peerj.5212. Wilson, J. A., and R. Allain. 2015. 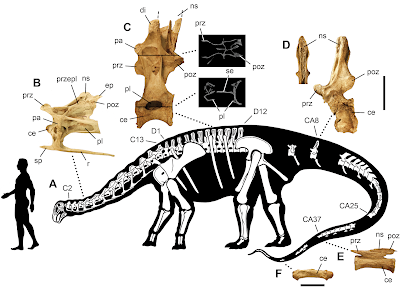 Osteology of Rebbachisaurus garasbae Lavocat, 1954, a diplodocoid (Dinosauria, Sauropoda) from the early Late Cretaceous–aged Kem Kem beds of southeastern Morocco. Journal of Vertebrate Paleontology 35(4):e1000701. doi:10.1080/02724634.2014.1000701.